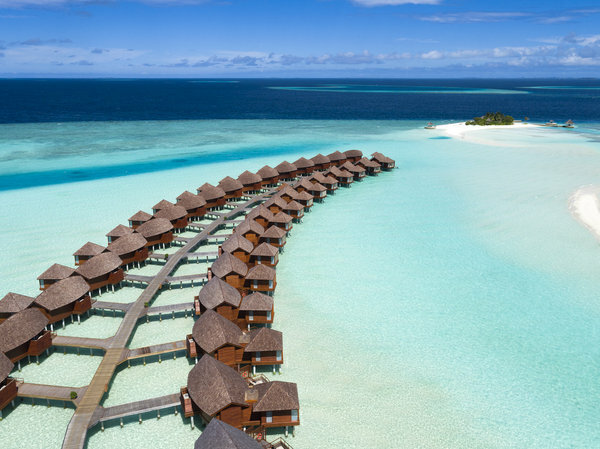 Located on Dhigufinolhu Island in the South Malé Atoll, Anantara Dhigu Maldives Resort features sweeping views of the Indian Ocean as far as the eye can see. With 110 rooms – a mix of beach villas and overwater bungalows – it’s big enough to have all the necessary amenities but small enough that you won’t feel like you’re packed into Times Square on New Year’s Eve. Overwater bungalows feature king-size beds, floor-to-ceiling glass doors that open onto your own private sundeck with direct lagoon access. Sip a cold glass of wine from your wine fridge while enjoying an indulgent bath in the standalone bathtub with breathtaking lagoon views or sip an espresso from your in-room machine while you watch the sunrise from one of the lounge chairs on your deck. With one and two-bedroom villa options and access to the Dhoni Kid’s Club, Anantara Dhigu Maldives Resort is the perfect family-friendly overwater bungalow retreat. From kayaking to kite surfing and parasailing to tennis, Anantara Dhigu has active adventures for everyone. Snorkeling and diving are the most popular activities with abundant puffer fish, stingrays, and baby reef sharks among a few of the species you’ll find. If catching fish appeals more to you than swimming with them, the resort offers deep sea and handline fishing programs. Surf the Nonyas break, a short boat ride away from the resort with their partnership with Tropic Surf. The resort’s Coral Adoption Program, run in collaboration with Aquafanatics, allows guests to participate in reef conservation and creation in the Indian Ocean by sponsoring a frame of coral (varying sizes, priced from $100-300). As part of the program, the guest works with the resort’s resident marine biologist to transplant coral into a frame, which is later moved to its permanent home in the lagoon. Sister resorts Anantara Veli Maldives Resort and Naladhu Private Island Maldives also take part in the program. Dining options at the resort are abundant and include Italian, Thai, and Japanese cuisines. Fushi Cafe serves a full breakfast buffet daily with a variety of live cooking stations. If the resort’s options aren’t enough (unlikely) or you just want to see more of the lagoon (highly likely) you can take advantage of adults-only dining options at the resort’s sister island, Anantara Veli Maldives Resort, which is located in the same lagoon. Enjoy a cooking lesson in the Chef’s Garden and sample typical Maldivian cuisine or escape to a remote sandbank for a private meal with the resort’s Dining by Design service. The resort’s spa features indigenous-inspired treatments in six overwater treatment suites with glass floors that allow views of the Indian Ocean. The signature Maldivian Coconut Marvellous treatment is 200 minutes of bliss including a Floral Foot ritual, coconut scrub, coconut wrap, and tension-releasing massage. Additional spa amenities include a pre- and post-treatment featuring a Jacuzzi and a plunge pool and a steam room and sauna. Whether it’s an intimate elopement for two on Gulhifushi Private Island or a wedding in front of friends and family at sunset beach, Anantara will assign you a dedicated wedding coordinator to help you plan your special day. Note that weddings in the Maldives are symbolic and not legally binding, so make arrangements to have your union formalized in the US. Fly Emirates to Male International Airport. From there, the resort is a 35-minute boat ride. Corals: A Quick Reference Guide so you can study up before adopting your very own coral frame.